A rendering of The Point in the Fenway. The tower would include 320 residences and retail. The Boston Redevelopment Authority on Tuesday approved construction of more than 1,100 new homes from East Boston to the Fenway, adding to a residential building boom that is already transforming large swaths of the city. The new homes, mostly upscale apartments, will be spread among four different city neighborhoods, where a combination of high rents and low vacancy has led to an increase in building activity. 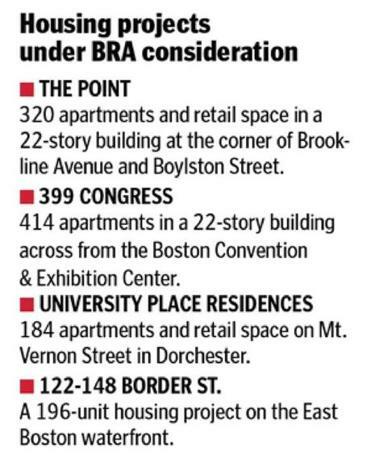 The largest project approved Tuesday by the BRA was in the South Boston Innovation District. Developer Madison Seaport Holdings LLC won approval to build 414 apartments in a 22-story tower at 399 Congress St. across from the Boston Convention & Exhibition Center. 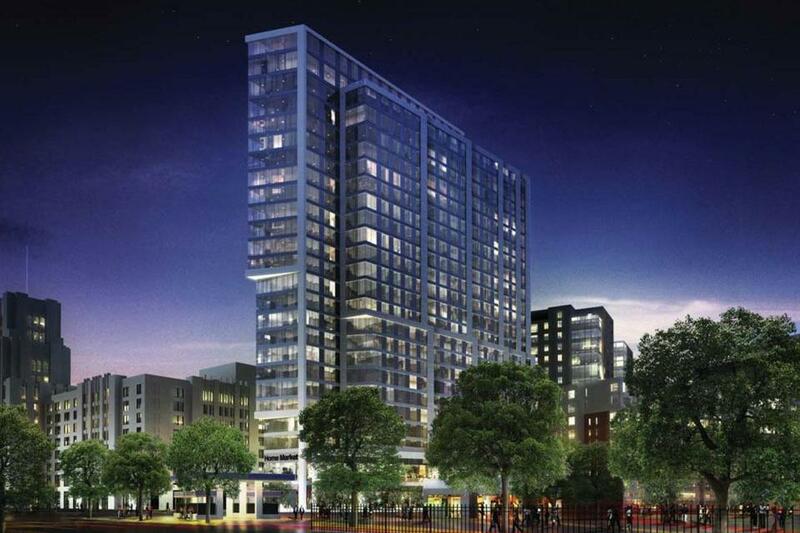 Other approved projects included a 320-unit residential tower at Brookline Avenue and Boylston Street in the Fenway; 184 apartments at 140-150 Mt. Vernon St. near the University of Massachusetts Boston in Dorchester; and 196 residences at 122-148 Border St. on the East Boston waterfront. Construction of those projects is by no means guaranteed, as they could face financial hurdles or other delays in the future. But their progress suggests developers remain bullish on Boston’s residential market, though more than 5,300 homes are already under construction across the city. A report on the multifamily housing market this week showed they have reason to be confident. With average rents of $1,850 a month, Boston remains one of the most expensive markets in the country, behind San Francisco and New York, according to Reis Inc., a research firm that tracks the multifamily housing market. The report found that Boston also has a vacancy rate of just 3.6 percent, well below the national average of 4.3 percent. To most developers, that means there is still money to be made, although some have begun to question whether the luxury rental market — units that cost $3,000 a month or above — is becoming crowded. The project at 399 Congress St. would be the latest of several massive apartment complexes to start construction in the South Boston Innovation District. Designed by ADD Inc., the project features a glass and precast masonry tower that will include a mix of studios, one-bedroom, and two-bedroom units. It will also contain 60 so-called innovation units — smaller apartments for singles who want to rent at a lower price than the traditional one-bedroom. The building will also have a roof deck. There will be 12,000 square feet of civic and lobby space on the ground floor, and 132 parking spaces will be constructed in an underground garage. Work is expected to start on the project early next year. In the Fenway, Samuels & Associates won approval for The Point, a slender, 22-story residential tower that will replace a low-rise retail building at the corner of Boylston Street and Brookline Avenue. The $185 million project will include 320 residences and two levels of retail. Most of the residences are expected to be apartments, although some condos may be included. Work is expected to start next summer. “We always wanted to create some kind of gateway or statement at this location, and I think this building accomplishes that,” said Peter Sougarides, a principal of Samuels & Associates. The building, designed by the firm Arquitectonica, features a multitiered glass facade that looks like several glass doors sliding into one another. The projects in Dorchester and East Boston will resurrect long-delayed revitalization plans. The project on Mt. Vernon Street will occupy what is now a parking lot near UMass Boston, which is pursuing plans to build dorms in the area. In East Boston, the plans for 196 housing units on Border Street will add to a recent spurt of construction near Maverick Square.